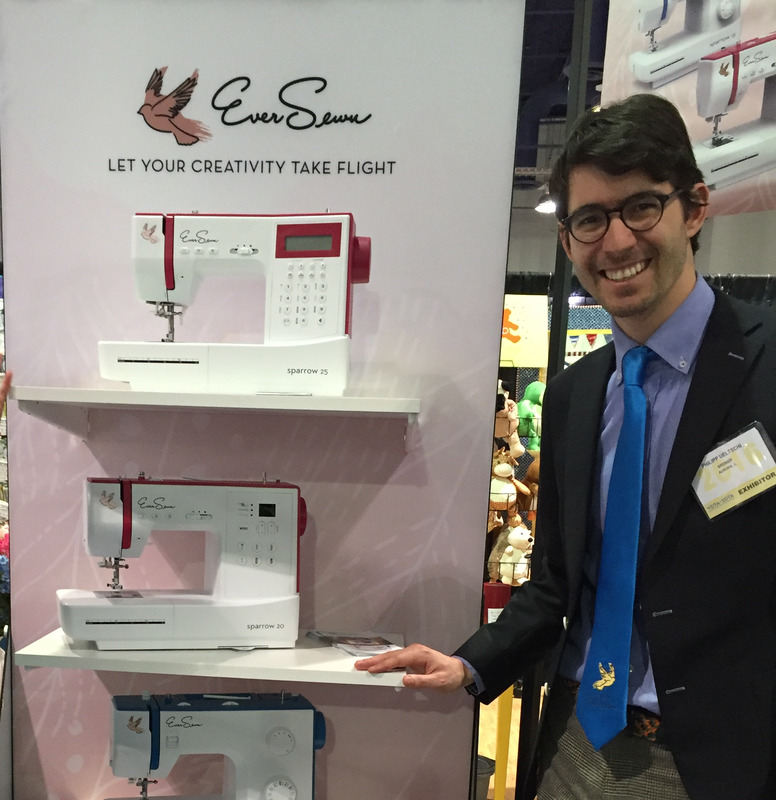 EverSewn is the sewing machine made for the new generation. The clean and sharp design of the EverSewn machines combine the classic design with a modern twist. 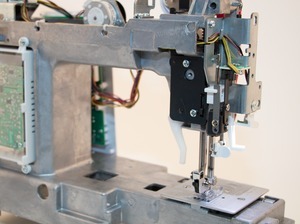 All three of the Sparrow machines are made at the same factory as Bernette machines, so you can know they are durable. The computer-controlled EverSewn Sparrow 25 is the top model in this series. It offers everything a creative sewer could need, at a very attractive price/performance ratio. 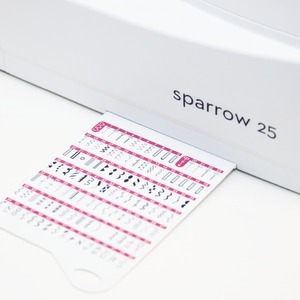 The Sparrow 25 boasts 197 stitch patterns in total, including 1 alphabet, 7 buttonholes, and 1 eyelet stitch. 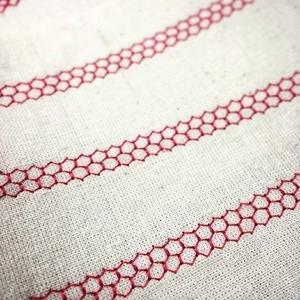 Decorative stitches can be set up to a width of 7 mm, as desired. 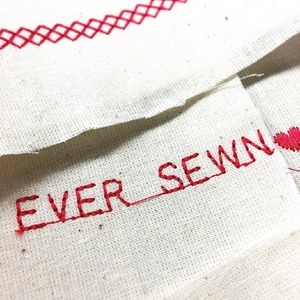 The memory function allows individual stitch combinations to be saved. 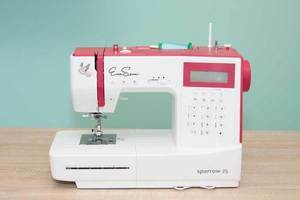 In addition to features such as the slide speed control, start/stop function and needle stop up/down, the EverSewn Sparrow 25 also has a bright sewing light. Seven presser feet (soles) come standard with this model. 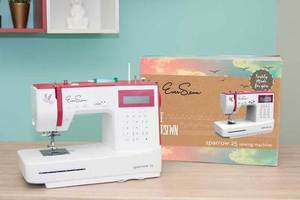 The EverSewn Sparrow 25 has 5mm stitching length with a 7.0mm stitching width, a 1-Step button hole, overlock, blindstitch, and a top load bobbin for embroidery. Phillip Ueltschi showing off the new line of modern machines. EverSewn Sparrow 20 and 25 Comparison. US Warranty 5 Years Mechanical, 1 Year Electrical, 90 Days Service Labor on defects in material and workmanship. 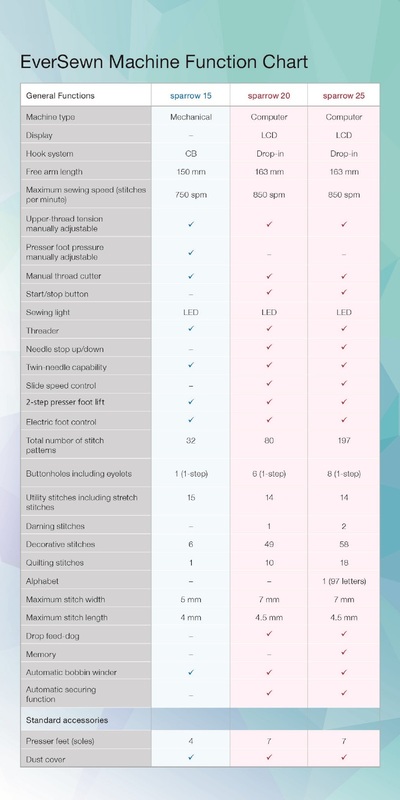 EverSewn machines offer high performance at an exceptional value. 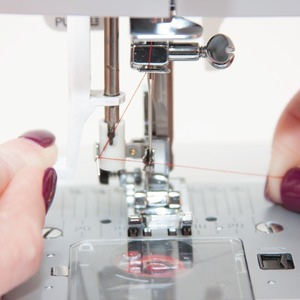 These machines provide a wide range of functions that are loved by all that sew on them. 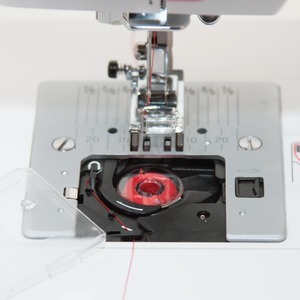 Whether you are just starting out or a seasoned sewer you will enjoy creating on these machines! 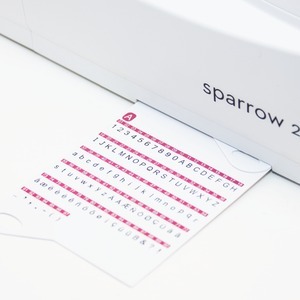 Confirm if Sparrow 25 or 30 Sewing Machine Insert Will Be Needed: Yes or No?